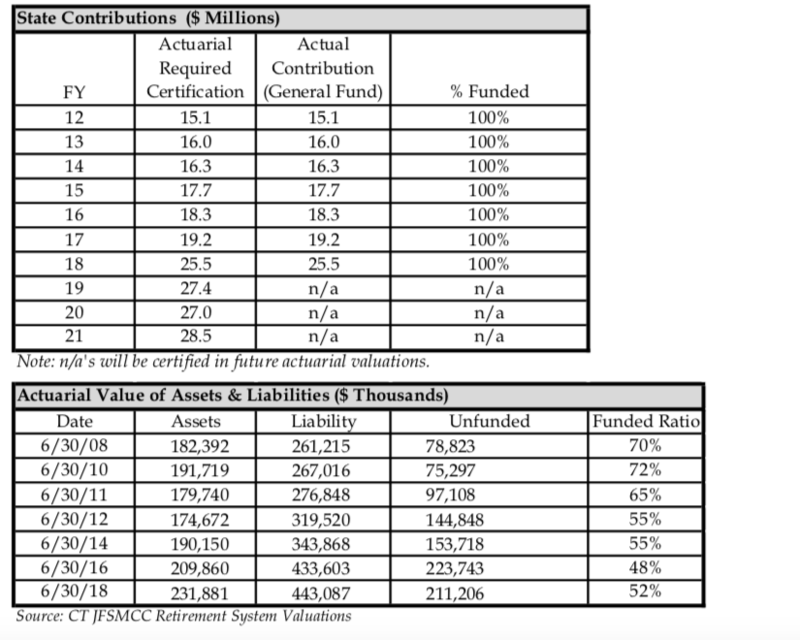 Part of the problem is that Connecticut did not make any contributions to the JFMCC Retirement System in 2010 or 2011, leaving a $31.6 million gap, according to the state’s actuarial valuations. The other part of the problem is that until 2017, the JFMCC Retirement System assumed an 8 percent return on the funds’ investments, but did not reach that goal on a year-over-year basis. According to the State Treasurer’s Office, the State Judges Fund — which is responsible for the JFMCC Retirement System’s investments — returned 7.31 percent over the past five years. The unfunded pension liabilities have driven the cost of employing state judges higher. According to a release by the State Comptroller’s Office, fringe benefits for judges, family magistrates and compensation commissioners now total 97.97 percent of payroll, essentially doubling the price tag for each employee. The cost of the JFMCC system rose from $15.1 million in 2012 to $25.5 million in 2018 to cover pensions for 493 active and retired judges — an increase of 68 percent in six years. Despite full funding, the unfunded liabilities for SERS has continued to grow, while TRS has shown slight improvement, but the costs continue to escalate and contribute toward Connecticut’s ongoing budget deficits. Nevertheless, SERS payments are projected to grow to $2.2 billion by 2023, while TRS payments could spike much higher by 2032 — an estimated $3.5 billion per year or higher, depending on market returns.